King’s Cup, the undisputed champ of drinking card games, is popular for a reason. It’s fast paced, varied, get’s everyone involved and isn’t super complicated. But for the same reasons, almost everyone knows how to play it. Instead, let’s examine some other drinking games using cards to add some variety to your next pregame! 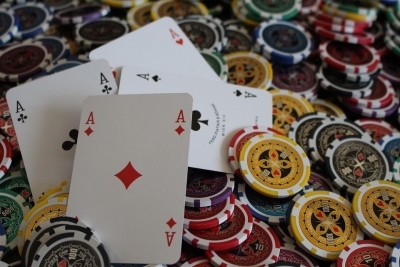 Like most drinking card games, Indian Poker is great for a small group with a light buzz. Everyone draws a card and holds it to their head without looking, so everybody can see the value of the other players’ cards, but not their own. Players decide whether they will play or fold, based on whatever info they can gain from everyone else. The goal is to have the highest card of the round. Feel free to play Aces high or low. The player to the left of the dealer decides whether to play or fold first, then each person continues clockwise around the circle until all players have made their decision. Once everyone’s made their choice, all players put their cards down face up. The player with the highest card wins. Repeat until desired level of drunkenness is achieved! One of the fastest paced drinking card games, Spoons is also good for larger groups of up to thirteen. Get a spoon for every player except one (so if there are seven players, get six spoons) and place them on the table. Deal out the cards so that every player starts with four. The ultimate goal is to get four of a kind and grab a spoon. The dealer begins by drawing a card from the deck and either keeping it and discarding one from their hand or passing it on to the player on their right. The next player in line then looks at the card and does the same and so on around the circle. Meanwhile the dealer continues to draw and pass cards. Cards are passed completely around the table as many times as it takes. As soon as one person gets four of a kind, they must grab a spoon from the pile. Once the first person grabs a spoon everyone else must also scramble for one. The loser is the one who misses out. If two players grab a spoon and neither lets go, the one holding the bowl end wins. Loser finishes off their whole drink, or drinks for the number of seconds as the denomination of the winning four of a kind, whichever is more. If someone gets caught with more than the original number of cards in their hand or blatantly paying attention to the spoons they must take penalty drinks. One strategy for Spoons is to take the spoon very discreetly when you’ve got a four of a kind. Most players are so focused on their cards they miss it entirely. On the other hand, you could scatter the spoons everywhere when you pick it up, creating a rush to grab spoons off the floor. For an alternate version of this drinking game, check out this Youtube video. 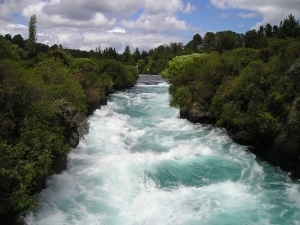 Imagine this river as a torrent of beer flowing into your face. Of all the popular drinking card games, Up the River, Down the River perhaps involves consuming the most party juice. Using multiple decks, an unlimited number of people can play. 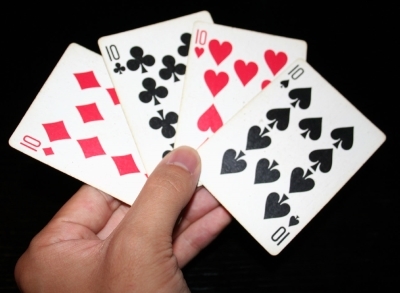 The dealer starts by distributing four cards face up to every player. Next, the dealer starts going up the river by drawing one card. Any player who has a matching card takes one drink. Continuing up the river, the dealer draws another card and any matching player takes two drinks. This continues for rounds with three drinks and four drinks. After the round of taking four drinks, the dealer draws a new card and starts down the river. Now when a player has a matching card, that player can give out drinks instead of taking them. Down the river rounds start at giving four and wind down to giving one drink. Basically the game can continue endlessly going up and down the river. Be careful with this one as it can lead to getting pretty drunk pretty quickly!